This is me Sarah mum of 3: The Dark side of the internet - copied content! The Dark side of the internet - copied content! The other day I found an email in my inbox from a kindly blogger, Jolene from Mumsgather informing me that she had come across a blog that was hosting copied content. Full blog posts that had been copied and pasted from her blog, my blog and several other blogs. I visited the blog in question and sure enough several of my blog posts were there, copied completely. My Silent Sunday posts and reviews all with my personal photographs and general rambling... in fact ALL my posts were there! So why would someone want to do this? and what can us bloggers, who are spending hours and putting lots of effort into our blogs writing original content do about it? Many people say Imitation is a form of flattery, and yes I guess it is, but the reason for my blog posts being copied is more direct than that, it is simply because the copier wants to get money from Google Adsence. You see Google Adsence has terms and conditions, one of which is that blogs must have decent content before adverts are allowed to be displayed, but some people simply do not have the know how to write a decent blog, so instead they steal other peoples post to make it look like they have a 'good' blog and then Adsence will accept them into the program. Once they have their Adsence account authorised and set up the copiers manipulate the adcodes so that when you click anywhere on the blog you are opening up Adverts, this gaining them even more money as each click is counted as an advert click through. They are directly using the hardwork from decent bloggers to get them traffic and clicks and make money, without the original bloggers permission. You can report any site to google Adsence, even if you are not sure if they are hosting copyrighted material, you can report if the site is manipulating clicks in an unnatural way. But of course if you know the site is hosting copyrighted content without permission then this is sure reason to report a break of the Adsence terms and conditions. When using this form you need to report individual links to each copied post, you can not just report the general site, so for the site above which has copied lots of my posts I have had to put in over 50 individual complaints linking to each individual URL. this is time consuming and very frustrating, but thankfully Blogger respond quickly and within 24hours I received email from them informing me they were disabling the content I had reported. 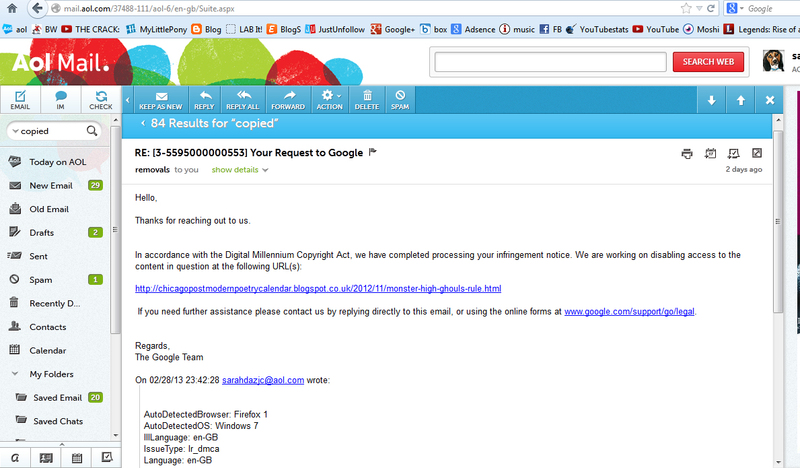 If the content has been copied onto a site not hosted by blogger you can report them to Google. This won’t get the content removed from the site, but should get them removed from Googles listings. As frustrating and time consuming as this is, we have to not be deterred, after all when we post things on the internet we always run the risk of someone coping our content, and using it in a variety of ways, and there really are no fail safe ways to prevent it, but we can stay vigilant, help each other out and report any sites we find who are using plagiarised posts. A great way to check if your blog posts have been copied is via Google Image search, which helps locate duplicated photos where you search for specific files directly to see where abouts the photos appear on the internet. Here is a good tutorial from A Mummy Too: How to find out if someone steals your image. I hope this information is of use to someone, please feel free to share it to help people report these sites making money from other peoples work. Sarah I am horrified, I'd love to know where these sites are. Off to check my images now and share your post! Wow, this sort of thing had never occurred to me. Thanks for writing this! I still can't get over just how incredible this is. It's bad enough to find one or two posts, but to find so many is beyond belief. Some people are just nasty. Thanks for sharing this. I had no idea. Thank you so much for sharing this. I'm so Naive, I didn't realise that this even happened! Sorry this has happened to you. Thanks for the blogpost - I'm in the same boat. 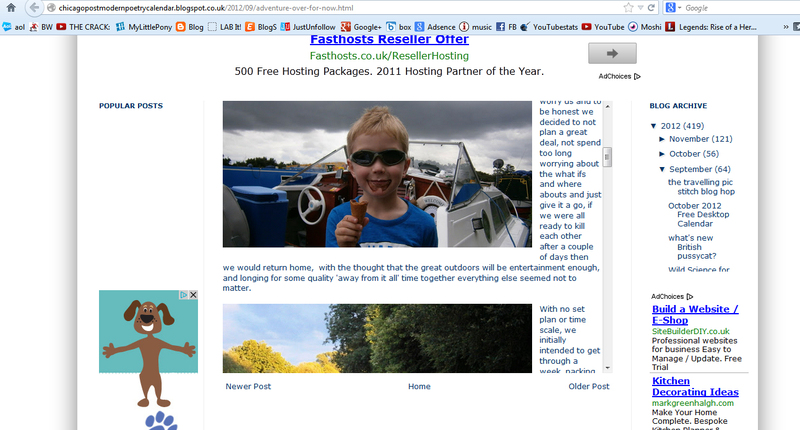 They were really cheeky and created a copy site with one letter different to my blog name. Unfortunately there are literally hundreds of copied posts so I think I'll lose the will to live before getting through them all !